Bare Minerals - The Flawless Make Up that lasts all day. We are extremely proud and excited to announce the relaunch of Bare Minerals, one of the country’s top 10 make up brands and the number 1 brush brand in the UK. We will have our experienced Bare Minerals Make up therapists on hand to advise you through the application of the products and find a product that best suits your needs. Please come in for any information or for Bare Minerals guidance. 100% pure Bare Minerals is make-up that performs like skincare, free of preservatives, talc, oil, waxes and fragrance. 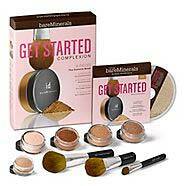 Bare Minerals is a dream come true for millions of woman of all ages, skin types and concerns. Bare Minerals must be seen to be believed. Come in and see us and we will colour match your foundation and give you a free 10mins demonstration.This make-up is so pure you can sleep in it.We offer a complete range of Bare Minerals Natural Make-up: Foundations, blushers, eye and lip colours. N.B. 10 mins free demonstration depending on availability.